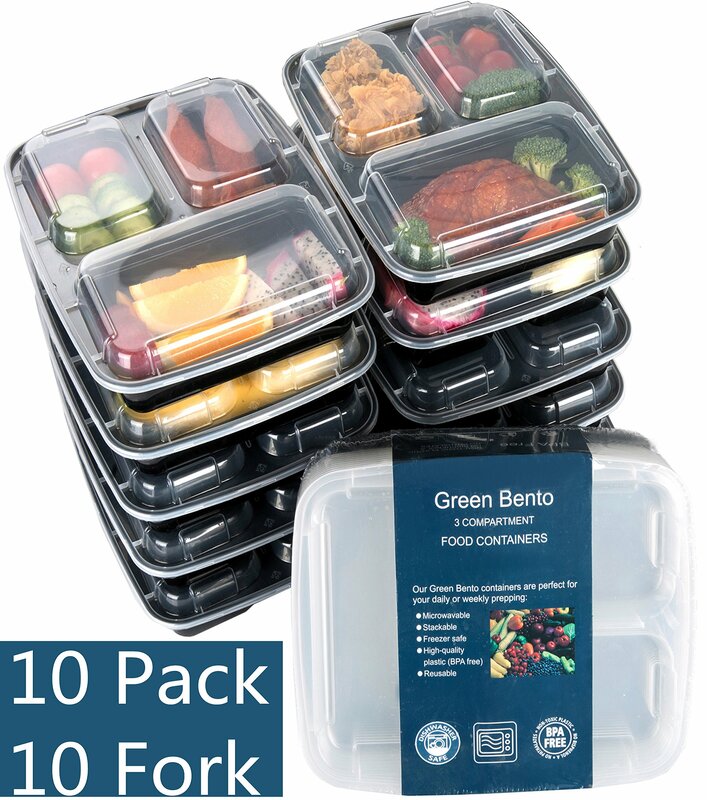 Home › Home and Kitchen › [10 Pack]3 Compartment Meal Prep Food Storage Containers With Lids/Bpa Free B..
Package Quantity: 10 | Size: 3-Compartment -Design The clear microwave cover for food display your delicious food inside of yourportion plate set; All food trays with snap-lock lids help keeping food fresh.Good insulation properties heating food up or cool them down. The bento lunchboxes are reusable, stackable, microwave safe. The long term food storagecontainers are created to withstand the microwave and dish washing machine.The divided containers are not as strong as Tupperware or hard plastic. Butthe food containers are reusable, under a recommended gentle hand wash. If you are dieting and want to control portion. Or you want to ensure ahealthy eating habit of your kids while at school. The food storage containerswith lids are ideal for daily meal prep. Each one can grab their bento lunchcontainers set and go. Convenient to carry snacks and leftovers such asChinese, Indian, or Sushi. The 3 compartments food containers allow you topack foods in healthy portion and cut down on lunch expenses. -For Adults/Kids Designed with eco-friendly, easy-open lids, leak-proof; the easy to carrybento containers allows you to bring food to work or school and eat healthymeals. Or carry to the outside, such as picnic or travel. Your bento lunchpack box is easy to load up on the veggies and keep the tasty indulgences to aproper amount. Dividing your lunch in 3 compartments helps you achieve yourdiet and weight management goals. The convenient food saver box can help youlead a healthy life by enjoying your DIY food. -Suggestions & Package Before microwaving, open a lid corner to allow steam to vent. The portioncontrol food plate containers are wrapped in a paper sleeve detailing themulti virtues of these divided lunch food containers. The healthy bento boxesare: BPA free, dishwasher safe, freezer safe, leak resistant, Non-toxic.